Tune in to the Official Spreaker podcast, hosted by Rob Greenlee, VP, Podcaster Relations at https://Voxnest.com (@robgreenlee) - Podcasting & Live Audio platform https://Spreaker.com and dynamic ad insertion platform Dynamo. The show is co-hosted by Spreaker podcaster Alex Exum (@alexexum) with podcasting how-to's, tool demos, trends, tips, and talks with leading podcast and radio leaders. Live Every Wednesday at 3pm PST/6pm EST. 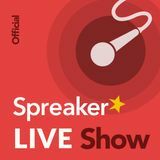 On Amazon Alexa: Say ... See More "Alexa, ask Spreaker to play "Spreaker Live Show"